Pure Coffee Blog: Can a Super Automatic Produce Good Espresso? Many coffee lovers either own or covet their own home espresso operation. To have stellar shots and scintillating lattes in the comfort of one's living quarters is almost as good as having your own personal butler-barista (kind of like Kato in the recent Green Hornet film). Yet many folks who strongly love espresso seem to go without an espresso machine simply because to get a quality espresso machine (like a La Marzocco or Rancilio), a micrometrical-adjustable burr grinder and the other necessary components (tamper, steel milk jug, etc) not only costs a handsome cent, but pulling quality shots takes practice and passion, calling for time and energy. Some folks just don't want to or cannot make such an investment. But if you're willing to compromise on quality, the good news is that the obstacles of cost, time and complexity go right out the door. Appliance empires have churned out thousands of no-skill-needed, super automatic espresso machines, allowing the average coffee drinker access to mediocre - palatable espresso, cappuccinos and the like at the push of a button. This all brings the obvious question: can a super automatic machine (one that grinds, tamps, pulls the shots, steams the milk and cleans itself without human aid) concoct decent espresso and cappuccinos? To try to address this query, the folks at Philips Saeco and at Ultimo Coffee in Philadelphia agreed to allow me to compare and contrast a high-end super automatic machine (Saeco's Syntia) next to Ultimo's high-end commercial La Marzocco. Heading over one brisk night to Ultimo coffee, joined by owner Aaron Ultimo, we set up the super automatic on a free bar top and began the experiment. We used the same water, milk and beans (Counter Culture's Toscano) to keep the variables low. As a higher priced super automatic, the Syntia machine boasts being certified by Italian coffee tasters as being able to produce an authentic espresso and cappuccino (sadly, I can't say that this means much as I've had horrible espresso from such "certifications"). The Syntia is also truly super automatic, as one button grinds the beans and pulls the shot for you; similarly if you want a cappuccino, you hit a different button and it grinds, pulls the shot and steams the milk too. Keeping the espresso function on the "short pull" setting, the shots were of a 3-4 ounce volume (a little high for "short") with an even, light brown crema. The flavor was reasonable, as it held all of the prominent flavors of the Toscano espresso blend but it fell flat after that, really lacking the subtler nuances of a good espresso. The body was dry and the drink overall proved lackluster. Adjusting the grind wasn't really too effective in changing the outcome, as the shots remained similar as we made the grind finer (to accommodate for the initial high volume). Overall, the espresso proved fair, with the flavors none too bitter and of a mediocre level. Testing the cappuccino, the machine steamed the milk first and then dropped the shots in, creating an odd vampire bite in the milk. Once again, the flavors were fair, with the milk and espresso producing a dry beverage with a muted sweetness and bit of cardboard. The machine produced little in the way of microfoam and overall, the integration of the espresso and milk was haphazard at best. Still, I have to admit that the beverage was still drinkable and on par with what I've had at some 2+ or 3+ cafes. Moving onto Ultimo's La Marzocco, one of Ultimo's baristas pulled some glorious shots that embodied a complexity of flavors including bittersweet chocolate. The shots were balanced and smooth, with a brown crema and velvety body. Ultimo's cappuccino also proved stellar, with a creamy texture of sweet milk complimented with notes of cocoa and honey. The latte art also showed strong integration of the elements. 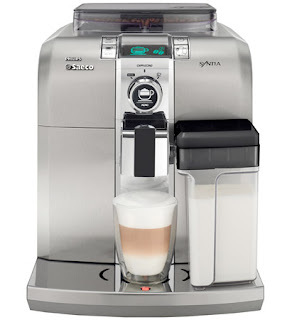 Clearly Ultimo's professional baristas made better drinks, yet in comparing their product to the Syntia's, I have to submit that a non-coffee geek would probably be satisfied with this super automatic. Using top notch milk, fresh well-roasted coffee beans and filtered water, the espresso and cappuccinos were decent enough in taste to make the average coffee drinker happy (especially if one plans to laden said drinks with lots of sugar and syrup). If you're looking for a simple (though expensive) espresso machine to make you a fair cappuccino, you would be justified in getting something akin to Saeco's Syntia. But if you have hopes of duplicating a drink you've had at a shop like Ultimo Coffee, try out CoffeeGeek's guide here on what equipment to buy. Basic home espresso doesn't have to be super expensive. For years I used a refurbished Gaggia Carezza that I bought for $150 and a $90 Baratza Maestro grinder. With just a little effort I was making espresso and cappuccinos that far exceeded anything I could get, at the time, in the Philadelphia area. Now, of course, we have a number of excellent coffee houses in the area - but my home espresso is still on par with them. And I still use the Carezza as a backup machine. It's over 8 years old and still running strong in spite of daily use until recently. Definitely true that if you're knowledgeable on what to look for and willing to dig into the fray of used machines out there, that you can snag a decent set-up for a couple hundred. Sadly, the same is not as true for new machines. Yes I still roast my own beans. There are only two good roasters in my area that sell retail. And neither roast date their coffee, so it is hit and miss when it comes to freshness. 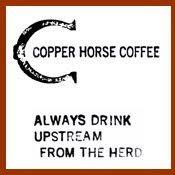 Although I can, of course, buy bags of roast-dated Counter Culture, Stumptown, etc., at the local coffee houses or mail order them. But I like being able to vary my own blends and SO espressos. And I can roast just enough to ensure my roasts are fresh. And it's a LOT cheaper. Gaggia has a very decent NEW entry-level machine, the Espresso Pure, that you can find for $150 on the interwebs (such as Wholelattelove). And very nice machines in the mid $200s. I'm stuck on Gaggias because of their massive brass group heads and commercial-size brass portafilters. I've never seen anything come close in value. Of course, you'll spend about as much on a decent burr grinder. And you need a good tamper. But it's worth it if you drink espresso/cappuccino everyday - you'll pay off the cost of the equipment in less than 1/2 year. Instead of a super automatic, try this excellent home barista machine that takes modest skill (since it does so many things automatically) to deliver great shots. And BTW, I enjoy a variety of coffees and espressos that kick off each of my days. Considering a home expresso machine...until then, I enjoy them at various coffee shops. Hey there, You've done a fantastic job. I will definitely digg it and in my view suggest to my friends. I am sure they will be benefited from this site. Great blog. I've actually used a few machines and sometimes have had better success in grinding apart from the main espresso machine. Good post. Still in awe how fine nuances are selected and compared. A good resource to draw from when the espresso article is on the drawing board. Blog on ! Definitely I will buy a decent burr grinder. And I need a good tamper. But it's worth it if I drink espresso/cappuccino everyday and will pay off the cost of the equipment in less than 1/2 year. Not the most intelligent comparison. Would have been way way better to do a blind test. Time the finish of the superauto process so that it coincides with when the barista finishes the pull. Then see if you can tell the diff. I'm pretty sure that in 10 tries, you might be lucky to have 70% accuracy. While blind is always better, in this case I felt it would be superfluous. The question was never could the super auto perform at the same level (or better) as a professional barista with a high quality machine; I don't think anyone in the industry would question the difference. I was just contrasting the two to show the differences. Plus, a blind test would have been a lot more to ask of the folks at Ultimo than courtesy would have allowed me (I would have had to monopolize their frequently busy bar). I really like your way of blogging. This is good post about espresso and I am agreed that don't compromise on the quality. There are various coffee machines in the market today that you can easily buy to make your coffee. It is important to choose the best coffee machines that make your cup of coffee just the way you like it. You are fully attentive in searching the best coffee machine depending on the particular type of coffee that you are wanted to brew. Espresso coffee machines are really a great stuff for coffee lovers. Espresso coffee maker forces live steam under pressure through dark roasted coffee grounds. Thanks for sharing this fantastic review and I have Enjoyed stay here. I don't think it needs an expensive coffee machine to make a good espresso. What you actually need is a high quality coffee roast, a good temp and lots of practice. There are loads of machines out there with reasonable price($200-$300) and their coffee are not bad at all. I would definitely hope so! It is very possible that you'll need is a high quality coffee roaster machine, also a good temp and lots of practice. 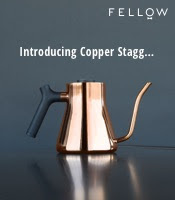 This is a good blog.I like this.Espresso coffee machines are really a great stuff for coffee lovers.I really like your way of blogging. I think most super automatic it takes a lot of fine tuning in order to get the best results. Setting a correct grind will usually fix most common problems, also using a water filter can help improve the taste. Cold coffee is always been my favourite in the afternoon to pick me up on a sunny day in a lonely beach which is refreshed and light with just right amount of natural sweetness from coconut water. Coffee is my favorite. After watch your recipe photo I am so hungry. Hope this week I will make it. Thanks for sharing with us. This is a good one. Thank you for sharing. This link shows the many coffee machines out there in the market. Hope we can exchange some pointers.